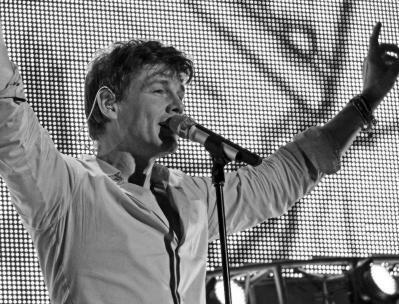 18 months after the break-up of Norwegian pop legends a-ha, spring 2012 has seen the release of frontman Morten Harket's new solo album and a world tour. Taking in Belarus, Belgium, France, Germany, Russia, Switzerland, the UK and Harket's native Norway – before heading to South America in autumn 2012. "The key thing for me when working with Morten – and many other artists for that matter – is consistency," says the tour's production manager James Maillardet. “Once we have a system in place that works, I am always keen to replicate it as closely as possible everywhere we go. Being able to carry a full Sennheiser microphone kit and IEM system along with our backline means we can easily achieve the consistency that Morten demands." The tour's microphone specification includes a Sennheiser SKM 5200-II with KK 105 S capsule for Harket's lead vocal, e 935 for backing vocals, four MK 4s on guitars, with e 901s, e 902s, e 904s and e 914s on the drum kit. Wireless monitoring comprises six Sennheiser ew 300 IEM G2 systems. Monitor engineer Kursten Smith started working with a-ha in on the band's penultimate tour and has stayed on board with Harket ever since. "The microphone specification came about when I was working with Sherif El Barbari, who was FOH engineer on the a-ha tours," he says. "It's virtually the same, except we are using the MK 4s on the guitars. The KK 105 and Morten's voice make a very good combination, the microphone helps the finer points of his vocal range to be heard, but without sacrificing any of its richness." "The KK 105 capsule is the perfect match for Morten's voice,” confirms front-of-house engineer Gerard Albo, who is working with the singer for the first time. "I'd usually use an e 935 capsule, as I have with Amy Winehouse, Anastacia, Corinne Bailey Rae and others. I was always reluctant to use a condenser microphone on live vocals, for fear of it being too bright and open to excessive spill. But I am very impressed with the KK 105's clarity, richness and consistent frequency response." "All the wired have clean, smooth characteristics. You don't have to do too much EQing to them," says Kursten. "The e 902 and e 904 sound 'fat' - they produce a great kick and tom sound. The e 914s sound great on overheads, producing a very smooth and detailed sound," Gerard adds. "I also have my own HD 25 II headphones with the very handy coiled cable, which I use for reference. I have been using HD 25s for the last 12 years and I never mix a show or a live broadcast without them." Kursten continues: "If I ever have any questions or problems I'm guaranteed a quick response from Pierre Morant, Sennheiser's Global Relations Manager for EMEA. If I want to try different options, Pierre makes suggestions and manages to send things out to try quickly."